Maplebeck, a small village in the Nottinghamshire Dukeries. Dedication: There are five English Churches dedicated to St Radegund. The best history of this Princess/Nun (c520-561) can be found on the Jesus College, Cambridge website. The College was built on the site of a medieval St Radegund's Convent. There is one page on St Radegund and another under 'Women at Jesus' which shows documents relating to the Convent. There is even a pub called St Radegund's close by Jesus College with its own Boat Club. There is no evidence as to why our church should be named after this saint. 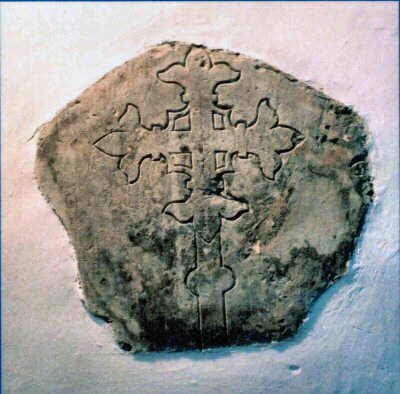 This medieval stone slab was found during the 19th Century restorations and is now mounted in the wall of the Nave. it is thought to be from a tomb cover in the original 11th Century building. History: The short history on a card in the Church says that the building was erected just before the year 1200AD, with the tower and spire added two hundred years later. It seems that the village lands were part owned by the Cistercian Monks at Rufford Abbey, while the Church, along with the neighbouring church, St John of Jerusalem in Winkburn, belonged to the Knights Hospitallers. 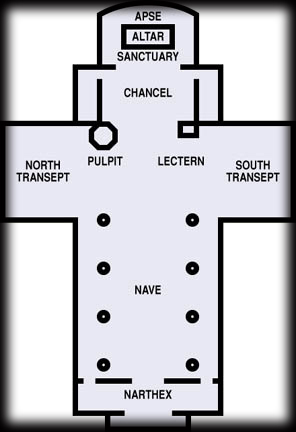 After the dissolution of the Monasteries the Church remained a Chapel of St John of Jerusalem in Winkburn. St Radegunds is known to have been derelict in 1660 after being wrecked by the Puritans. Stone pillars embedded in the north wall may have been part of the medieval stone altar. The Church was used as a barn and stable for a number of years. Fortunes changed slowly after the Duke of Newcastle built the Vicarage (c1850) and installed the Rev Parsons Turton as Vicar. Yet even after he had been Vicar for 47 years, the north wall of the Nave was in a state of collapse and services had to be held in the Chancel. It was not until after his death in 1898 that he left money for the restoration of the Church which was almost completely rebuilt, re-roofed and the interior re-ordered with simple pews, pulpit, and choir. A new stained glass window by C E Kempe was installed at the East End. 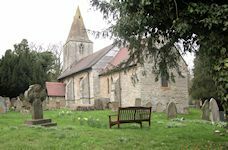 For further archaeological history of ours (soon to be entered) and other local village churches visit this site http://southwellchurches.history.nottingham.ac.uk. Bells: In 2008 the bell tower was cleared of many barrow loads of bird debris. The ancient oak bellframe had rotted, and a new galvanized steel frame was fitted with four bells which are rung full circle. A full description of the work is on a card in the Church. Two original bells are dated 1635 and 1664, cast by George Oldfield. The Sanctus Bell dates from 1450 and was cast in York. The Southwell and Nottingham Guild of Ringers did much of the labour of the restoration, assisted by one or two strong local residents.